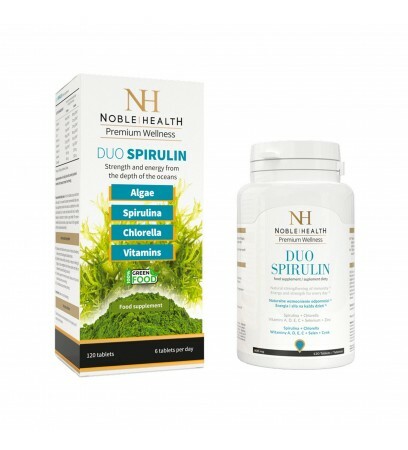 Noble Health Duo Spirulin Algae Spirulina Chlorella 120 Tablets. It is a natural immunity enhancer, which provides strength and energy for each day. Strength and energy from ocean depths. Boost your immune system and feel a great dose of energy. Spirulina and chlorella are a source of natural antioxidants, which protect your body against oxidative stress. Spirulina gives energy (lowers the feeling of fatigue), boosts the immune system, and helps maintain proper glucose blood levels. Chlorella supports the immune system, it also takes care of your liver and provides energy. Zinc participates in the proper synthesis of proteins. 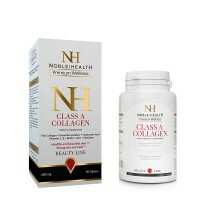 Who should use the Duo Spirulin product? 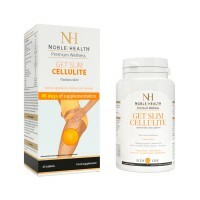 What are the full ingredients of the Duo Spirulin product? Powdered algae: spirulina (Arthrospira platensis), chlorella (Chlorella vulgaris); glazing agent - microcrystalline cellulose, potato starch, carrier - cross-linked sodium carboxymethyl cellulose, emulsifier - hydroxypropyl methylcellulose, anti-caking agent: magnesium salts of fatty acids; L-ascorbic acid (vitamin C), DL-alpha-tocopheryl acetate (vitamin E), zinc oxide (zinc), vitamin A (beta-carotene, retinyl acetate); sodium selenate (selenium), cholecalciferol (vitamin D). How does the ingredients of Duo Spirulin work? 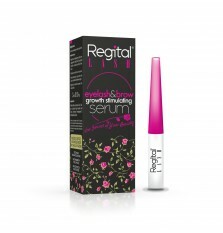 How to use Duo Spirulin? Recommended use: From 3 to 6 pills per day, wash them down with water. You should not exceed the recommended daily dose. 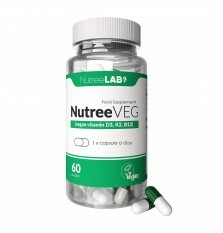 The food supplement cannot be used as a substitute for a varied diet. A balanced diet and a healthy lifestyle are essential to a good health condition. 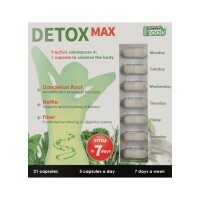 The recommended daily dose guarantees positive benefits to your health. How to store Duo Spirulin? Duo Spirulin should be stored at room temperature, in a dry place. Keep away from small children. 6. How many tablets are in one Duo Spirulin package? One package of Duo Spirulin contains 120 tablets. Does Duo Spirulin contain allergens? Can I take the product during pregnancy or breast-feeding?